Scientists and researchers from around the world gather in Haifa for the inauguration of the Technion Integrated Cancer Center (TICC). Scientists and researchers from around the world gathered this week in Haifa, Israel, for the inauguration of the Technion Integrated Cancer Center (TICC). The center is a first-of-its kind hub for global cancer research, which will expedite the discovery of new diagnostic tools and treatments through a collaborative “bench-to-bedside” approach. 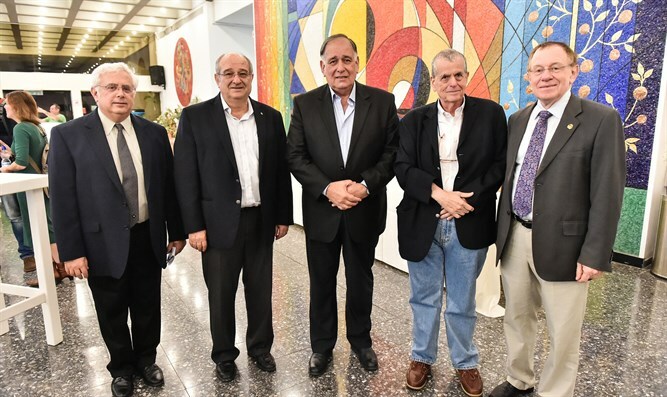 “Conquering cancer is one of the global community’s most pressing challenges, and it requires an interdisciplinary approach,” said Technion President Professor Peretz Lavie. “We need the collaboration between basic scientists, biochemists, cell biologists, computer scientists and experts in microscopy and imaging. We need the engineers, and we need the clinicians—and they are all at the Technion,” he added. Keynote speakers at the inauguration were Professor Douglas Hanahan of The Swiss Federal Institute of Technology in Lausanne (EPFL), who spoke about mechanistic insights into multistep tumorigenesis and its (evolutionary) adaptations, and common mechanisms that can be targeted by drugs; and Saul Singer, co-author of Start-Up Nation, a New York Times and Wall Street Journal bestseller, who said expressed his opinion that in no more than 10 years we will all wear wearable sensors that will monitor our health parameters and detect diseases in an early stage, when they are still curable. In addition to serving as a hub for multiple fields of research, the TICC will also be a nexus for the Technion’s five affiliated hospitals that run clinical trials. It will be co-led by Professor Ze’ev Ronai and Distinguished Professor Aaron Ciechanover – who along with Technion Professor Avram Hershko and the late Dr. Irwin Rose won the 2004 Nobel Prize for the discovery of the ubiquitin system. Professor Eyal Gottlieb, an expert in cancer metabolism, who investigates the role of altered energy metabolism in supporting cancer development, heads the Laura and Isaac Perlmutter Metabolomics Center under TICC. The Technion recently ranked in 36th place on the Times Higher Education (THE) list of top 200 universities in Asia. In 2014, American television legend Larry King joined the Technion to establish the Israel Silicon Valley Chambers of Commerce. The Technion, which has earned a reputation as one of the world’s leading science and technology universities, recently expanded to New York and China.